How a stay-at-home mom accidentally built and sold a company for $10 million. (Business 2.0 Magazine) -- How did a stay-at-home mom start a business that she later sold to Crocs for $10 million? 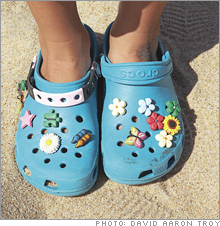 "It was an accident," says Sheri Schmelzer, 41, of Boulder, Colo.
One day in summer 2005, she decided to use clay and rhinestones to make charms that would fit snugly into the holes of her family's 10 pairs of Crocs. When husband Rich came home, he saw the potential. 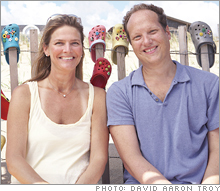 Sheri and Rich Schmelzer started with clays and rhinestones, and finished with $10 million from Crocs. There are 26 million pairs of Crocs in the world, more than 80 percent of them speckled by holes, and many of those shoes are on the feet of accessory-friendly youth. Jibbitz, as the charms (and the company) came to be known, can be anything - peace signs, flowers, you name it - to please a demographic eager for variety. Within weeks, the Schmelzers set up a website for sales. By the end of the summer, they were funded by home equity, with their parents working the assembly line in the basement. Jibbitz isn't just a family-business fairy tale: It's a study in piggybacking on a product phenomenon. In February, when the company sold its 250,000th piece, Jibbitz products were carried in 300 stores and pulled in $212,000 in sales; 6 million pieces of Jibbitz later, in August, the products were in 3,000 stores and garnered sales of $2.2 million. The Schmelzers outsourced manufacturing to Asia and stepped up to a 12,000-square-foot office and warehouse in Boulder. In October the Schmelzers agreed to take $10 million from Crocs for the company, which will operate as a subsidiary, plus $10 million more if they hit earnings targets. Sheri Schmelzer still can't believe her luck - or her newfound riches: "I've been sitting here the whole year saying, 'Oh, my God.'"